The Navajo Indians of North America have a long, rich history of artisanal jewelry making, though silver-smithing is a relatively modern art form for them. Navajo rings, in particular, were intricately made with precious metals and stones. 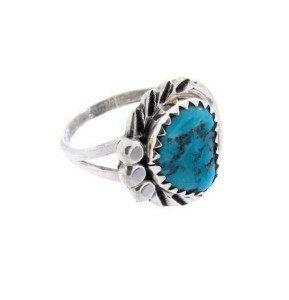 Silver and Turquoise are classically utilized materials in the Navajo rings creation. These modern materials were brought by Mexican Plateros (silversmiths) and European settlers to the West in the 1850’s. Many tribes began using Silver, which was melted and poured into molds, stamped, or slowly pounded out to create delicate designs. Inlaying Turquoise and other precious stones further accentuated the lovely designs of the Navajo rings. Early silversmiths used American or British coins which they melted down and transformed into intricate pieces of jewelry. At first, Navajo rings were quite heavy, but as the form progressed became more lightweight. The tradition was then handed down from generation to generation, resulting in modern Navajo rings, necklaces, bracelets and functional items that are as beautiful as pieces made 150 years ago. Three-pronged shanks are often used in the design of Navajo rings. Thick silver wires with flattened sides hold the Navajo rings onto the finger. The three-prong design allows stones and jewels to be strongly fastened and supported by the ring. It is well known that Navajo rings are extremely well made. Navajo rings are held in Native American artistic jewelry collections at many major art museums throughout the world. The museum of Natural History has an extensive collection of Navajo rings, and other Native jewelry. To appreciate the true wonder of Navajo rings though, one should travel to the American Southwest. The Native peoples of Arizona, New Mexico and Oklahoma all created beautiful handmade jewelry items, but Navajo rings have always been special. Jewelry was often worn in tribal religious ceremonies. Many of the gemstones used to create Navajo rings held deep spiritual meaning. For example, Turquoise, which is the most popular stone in Navajo rings, is thought to bring good luck to the wearer and to promote healing from within. It is said in Navajo folklore the God loved Turquoise so much he threw some into the heavens thereby creating our blue skies. The shapes that are stamped and etched into the metal of Navajo rings also has symbolic meaning. The arrowhead, for example, symbolizes the spirit of adventure within us. Navajo rings are certainly a smart investment, as their value increases over time. Well made jewelry is meant to be handed down through the generations. Copyright © Whole Sale Navajo Jewelry 2019. All Rights Reserved.